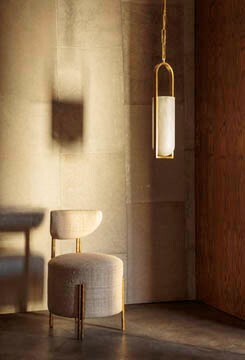 Please contact our sales team at 323-895-7880 or at concierge@kellywearstler.com to purchase this item. Elegant yet distinctive, the Pickfair Mirror is composed of a three-panel, micro-seamed clear mirror over an ebonized walnut frame with brass prongs in a signature burnished bronze patina. Its quiet yet soulful silhouette adds spirited panache to any space. Drawing inspiration from the natural veining of stone and marble, the organic line work of Tracery shifts and shimmers as the light hits the silk threads. The background is Tibetan wool in a warm grey colour, with the motif in soft olive green silk.